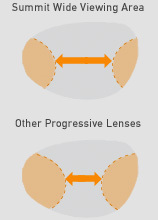 Prior to Free Form technology, Summit CD was the first progressive lens to make smaller, more fashionable frames possible. Computers and virtual reality software once designed lenses so advanced they couldn’t be made, because the technology to produce them didn’t exist yet. HOYA developed the Summit family of progressive lenses during this era, including the Summit ECP, and the Summit CD (compressed design), which incorporated the ECP design into smaller frames. HOYA's patented Integrated Transmittance Control (ITC) Technology utilizes a 3-D virtual computer model to evaluate multiple visual criteria and deliver the clearest, most comfortable vision possible with traditional surfacing technology.